EPCOT Center, 1986. This is where the park truly came alive for me. I was beginning to grasp some of the more intangible ideas being presented, I was in the early stages of understanding that there was a great big world out there that I knew little to nothing about, and art was everywhere I looked! For the park, it was not yet fully complete, but it was well on its way. Wonders of Life hadn’t been constructed in Future World yet, but Horizons and The Living Seas had been actualized. In World Showcase, the signs for pavilions like Equatorial Africa and Israel had come down without the areas being constructed, Norway was but a dream, but there were a set of Danish inspired restrooms and Morocco had been added to the promenade’s skyline. 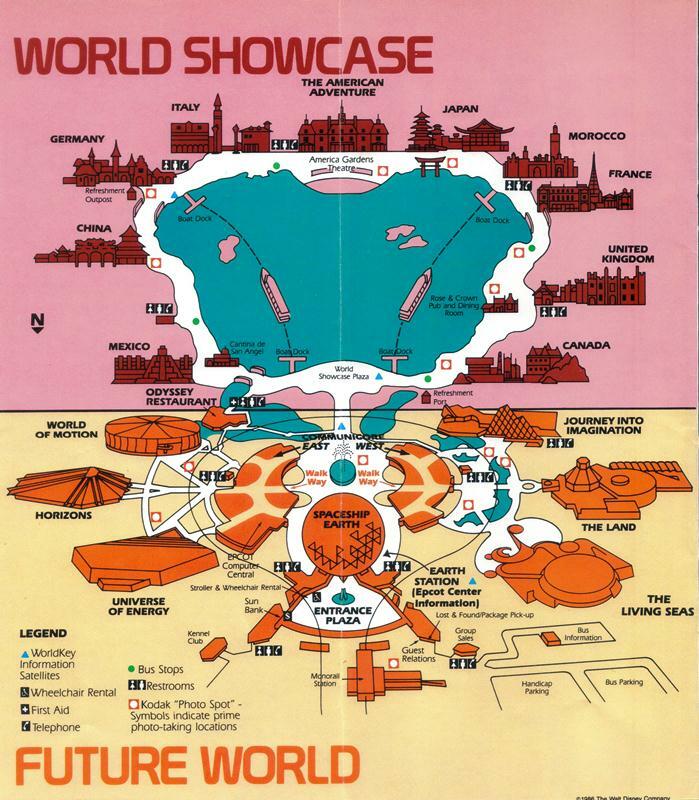 These were also the days in EPCOT Center’s history when World Showcase and Future World shared the same hours. If the park was open to guests, every area was open and awaiting adventure! The EPCOT Center Guide Book was a way of remembering the worlds I had visited only yesterday, they were my introduction to map/blueprint design (something I still like to fiddle with today), and, between the text and abundance of pictures, they were the perfect way to get excited on the incredible long hour drive from my house to the park. So, today, let’s pretend we’re walking in on the morning of October 2, 1986. Where should we head to first? Where should we have lunch and dinner? We only have one roll of 24 exposure film, should we utilize the Photo Spots or wing it and take our own pictures? If we’re winging it, what do we want pictures of? Most importantly, let’s have a fantastic day today, as we dream of tomorrow! You say the park was not fully complete back then; do you consider it fully complete now? Or perhaps it's in a constant state of change, and there is no such thing as completed as long as there is imagination left in the world. Just thinking out loud. 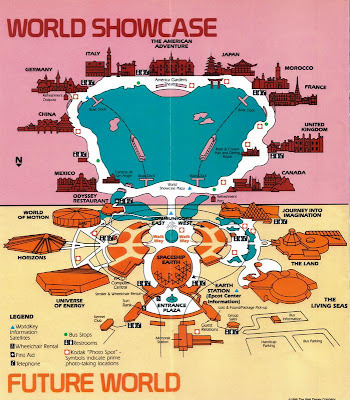 Thank you for posting this; I didn't get to Epcot until 1993, so this is a great way to get an overview of the park in '86. What a beautifully produced guide! Rich - The guides from the 1980s and the early 1990s are, to date, some of my favorites!